You know about the potentially world-ending Supervolcano hiding under Yellowstone, right? Well, scientists just discovered a second magma chamber containing an additional 46,000 cubic kilometers of molten rock. Did we mention it’s “overdue” for eruption? Apparently not everyone is aware of the Yellowstone Supervolcano. That’s crazy because it a) has the potential to wipe out not only this country, but possibly human life on this planet and b) it’s super interesting. It’s also fun to write about, because you get to be all doom and gloomy. So, before we get into all the people dying and planes crashing and Ian Ziering fighting sharks with chainsaws stuff, let’s be very clear about one thing: this new discovery does not mean the apocalypse is nigh and does not increase the chances of an eruption. It just furthers our understanding of this fascinating, potentially cataclysmic thing. So no, you don’t have permission to start looting. Yet. Because the report announcing the discovery of the second magma chamber (more on that later) was just published yesterday, scientists haven’t yet had time to calculate its apocalyptic impacts. So, let’s look at what they thought it could do before. The first time this volcano erupted, 2.1 million years ago, it was 25,000 time larger than the 1980 eruption of Mt. Saint Helen. In his book “Windows into the Earth”, geophysicist Bob Smith says, “Devastation would be complete and incomprehensible.” He goes on to explain that the eruption would be signaled by a swarm of earthquakes, followed by a massive blast that some estimates say would immediately kill 87,000 people. Large parts of Idaho, Wyoming, Montana, Colorado and Utah would be wiped off the earth, while a 10-foot layer of ash would blanket everything within 1,000 miles. That ash would be launched 20 miles up, into the jet stream, spreading it around the world. The immediate effect of that would be a cessation of all air travel, globally, but the long term effects of the ash are what’s potentially the extinction-level event. Two-thirds of the US would be an ashen wasteland by this point, including pretty much all of our food production regions, but the Supervolcano’s ash also has the potential to create a “volcanic winter,” plummeting global temperatures by 21 degrees or more. The resulting crop failures and subsequent starvation is what would do humanity in. But hey, look at the bright side: global warming would be a thing of the past. The last time the Supervolcano erupted, 640,000 years ago, it spewed just 1,000 cubic kilometers of lava into the atmosphere; its tephra fell as far away as Louisiana. Now, we know the two magma chambers under Yellowstone have a total volume of 56,000 cubic kilometers. The Supervolcano has erupted 2.1 million, 1.2 million and 640,000 years ago. Averaging the time between those eruptions results in the conclusion that we are “overdue” for an eruption. However, the odds of that happening during our lifetimes are pegged at one in 10,000. This illustration from the report shows the newly-discovered magma chamber in the lower crust. “The Yellowstone magmatic system from the mantle plume to the upper crust” was published in Science Magazine yesterday. It reports the findings of scientists who studied seismic waves from earthquakes as they passed through the earth’s crust. These waves slow as they pass through liquid, allowing researchers to determine the size, shape and location of magma chambers, deep underground. Local earthquakes enable seismometers on the earths’s surface to track seismic waves through shallow portions of the crust, while distant quakes enable them to look deeper. This study is the first time the two types of data have been combined. 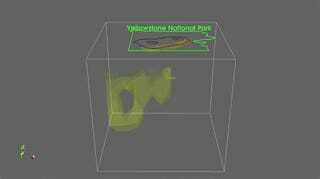 Previously, scientists studying the Supervolcano knew of a plume that carried magma up from the mantle to a point 60 kilometers below the earth’s surface. And, a 10,000 cubic kilometer magma chamber 10 kilometers down. This new chamber is described as a “missing link,” connecting the two. It spans from 20 to 50 kilometers below the surface and contains melted basalt tot the shallower chamber’s melted rhyolite. That confirms a long-held theory of how volcanoes work, with a deeper chamber of denser material feeding an upper chamber of lighter substance. The findings will be a boon to scientists studying past eruptions of the Supervolcano, enabling them to more accurately model how magma moved during previous eruptions and increasing their understanding of all the apocalyptic stuff that may occur during the next. I, for one, look forward to learning how much more of the earth will be blanketed in ash or wiped out by the fiery explosion, should the Supervolcano ever again live up to its promise.